Zane Benefits, the leader in individual health insurance reimbursement for small businesses, announced today the publication of a new eBook, "The Nonprofit Guide to Individual Health Insurance Reimbursement." 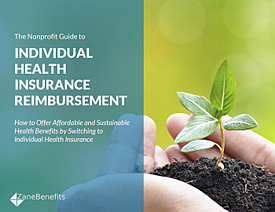 The guide helps small nonprofits switch to individual health insurance reimbursement to offer affordable, sustainable health benefits. According to Zane Benefits, small nonprofits face unique challenges in hiring and retaining employees. With limited resources, leadership teams must be strategic about how to allocate compensation and benefit dollars. When it comes to health benefits, controlling costs has become a major challenge. To gain control, nonprofits are switching from group health insurance to individual health insurance reimbursement. The new eBook outlines how small nonprofits can save 20 to 60 percent on healthcare costs by reimbursing employees for individual health insurance.